To order Paperback or Kindle, click here. 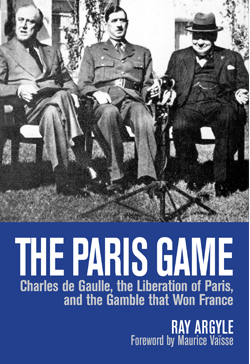 Long dismissed as a vain and arrogant self-seeker after glory, Charles de Gaulle is revealed in The Paris Game as a transformative figure of the twentieth century whose unflagging determination brings France back from defeat and saves it from the twin threats of Communism and dictatorship. After years in political exile, a revolt in Algeria threatens France with civil war, giving de Gaulle the chance to make good on his final gamble to reshape the Republic. Restored to power, he exults: “I have played my cards well. I’ve won!” As President of France, he sees the country prosper and its culture flourish anew, while he stakes out an independent path in global diplomacy, setting an example for other middle powers once the threat of the Cold War is lifted. Hello, I have an interest in The French Resistance and Jean Moulin in particular and wonder whether you are able to throw any light on the following? : You state in your book that Moulin stayed in small out-of-the-way hotels, for security reasons. During a recent visit to Marseille I went in search of the Hotel Moderne where Moulin stayed. However there appears to be some uncertainty about it’s wartime whereabouts. SOE agent Peter Churchill, in his book “Duel of Wits”, and others have described the location as being on or near the Cours Belsunce. Cours Belsunce cannot be described as being out-of-the-way, but Rue Breteuil is more so and this is where a fairly old and small Hotel Moderne is situated. Additionally Peter Churchill talks about the reception cubicle being on the first floor, which fits the hotel on Rue Breteuil. Do you have any information or sources which may help to determine the exact whereabouts of the wartime Hotel Moderne? Thank you for your interest in The Paris Game. I think you have probably found Moulin’s Hotel Moderne. None of my references give an actual address but your description sounds bang on. Did you have a chance to observe the age of the building or to ask any staff about its history? It is great fun to track down these historic locations. I particularly enjoyed finding the location of Moulin’s art gallery on rue de France in Nice, and the building in which the united resistance was formed, on rue du four in Paris.